The Lamborghini Huracan Spyder LP610-4 is the quintessential Italian thoroughbred: loud, full of bravado, fun to drive and, naturally, resplendent with a few quirks. A follow-up to the existing Huracan coupe, the Huracan drop-top has been on sale in Australia for a couple of years. But any excuse for a re-\visit is always exercised, especially when the Huracan makes use of an Audi-sourced 5.2-litre naturally-aspirated V10 engine bringing 449kW and 560Nm outputs. The model on test, the Lamborghini Huracan Spyder LP610-4, also sends drive to all-four wheels via a prodigious seven-speed dual-clutch transmission. The Audi connection is not by coincidence. Under Volkswagen’s parent ownership, the Huracan and Audi R8 share much in common under their differing exteriors – the R8’s understated and the Huracan’s almost shard-like. The Huracan is positioned as Lamborghini’s entry-level supercar, wedged below the all-empowering V12-powered Aventador in price and performance. It is no longer Lamborghini’s cheapest model, however; that mantle now rests with the Urus SUV. You should treat the Lamborghini Huracan Spyder’s $471,000 price tag as a starting point. Once you add obligatory on-road costs ($49,978), the Spyder is well into half a million dollar territory. Then, there are the myriad options to wade through. Our particular test featured some $90,000 worth of add-ons including the striking Blu Nethuns paint ($27,500), 20-inch wheels ($10,140), front/rear parking/reversing camera ($5700) and floor mats ($1000). Even cruise control will set you back $1400. A cheaper, two-wheel drive version of the Huracan exists in the form of the LP580-2. It costs $429,000 (plus on-road costs) but offers lower 426kW/540Nm outputs. On the ownership front, Lamborghini asks for an additional $13,400 to cover the Huracan with its five-year factory warranty. Unlike Ferrari, which offers seven years of free servicing with each new purchase, the Raging Bull quotes approximately $6000 for the first three years. Why should/shouldn’t I buy it? The Lamborghini Huracan Spyder imbues occupants with open-top theatre that is virtually unmatched by any supercar. That itself is impossible to place a dollar figure on. In any gear and at any speed, there is a real personality to the Huracan, accentuated with the open-air feel of the Spyder. It is relatively comfortable and useable in regular driving, especially in default Strada mode, but will quickly unleash its potential with a prod of the accelerator. Key to this is the car’s mid-mounted naturally-aspirated V10 engine. It is simply magnificent, offering crisp throttle response, a tractable torque curve and a really useable bandwidth of revs – even beyond 8000rpm. The soundtrack is equally endearing, as raspy and rambunctious as the car itself. When pushed, the atmo-10 can return a claimed 0-100km/h time of only 3.4 seconds, and top speed of 324km/h. Impressive. Surprisingly, the big V10 didn’t use as much fuel as you would think, either, averaging 14.4L/100km through a mix of conditions. Elsewhere, the Huracan’s ride feels slightly firmer than its R8 stablemate, though the Lamborghini is balanced enough to be driven every day. Its steering is accurate and well weighted, helping quickly establish a connection and confidence from the driver. A key reason against buying the Lamborghini Huracan Spyder is if you’re over 180cm tall. Even at this height, your noggin will be touching the soft-top fabric, such are the proportions of the cabin – in part necessitated by roof mechanism. Making this problem worse, the seat isn’t set low enough in the cockpit and there are limitations to fore/aft seat sliding adjustment. Elsewhere, the Huracan’s gripes are mostly cosmetic. Its centre dashboard interfaced (again, Audi-derived) is beginning to feel its age in the face of newer rivals, the cabin is devoid of a USB point and storage is extremely limited, both in terms of incidental hidey holes and luggage space. Forward and rear vision is also slightly obscured, especially in the company of the R8. The Huracan’s prodigious engine performance, slick-shifting automatic and all-wheel drive grip should make it appeal to almost anyone. Gone are the days where Italian thoroughbreds were purely cantankerous, twitchy beasts; the Spyder is easily accessed and easy to drive. Even the folding fabric roof can be stowed or raised in 17 seconds at speeds of up to 50km/h.Equally, the car’s broad dynamic skillset means it will appease driving enthusiasts. 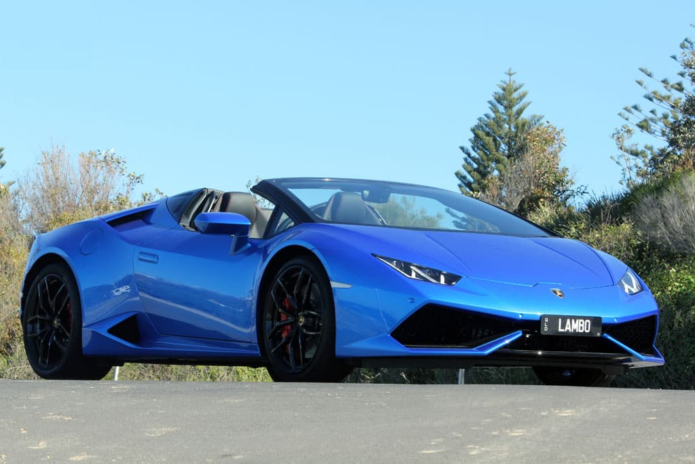 On our heavily speed-limited drive through the Royal National Park south of Sydney, the Huracan Spyder impresses with its levels of grip, turn-in response and balance on public roads. Granted, its 1572kg mass doesn’t feel quite as agile as McLaren’s 570S Spyder, but for 99 per cent of the population (including your correspondent), that isn’t likely to matter. Packaging gripes aside, there is little that is quantifiably wrong with the Lamborghini Huracan Spyder, but there is so much that is emotionally right. Its V10 engine is the true calling card, and against a backdrop of harsher emissions (read: more smaller-capacity turbo engines and electrification), you can’t help but feel Lambo’s drop-top will be revered for many years to come. How much does the 2018 Lamborghini Huracan Spyder LP610-4 cost?